An introduction to U.S. macroeconomic policy issues, such as how we use monetary and fiscal policies to promote economic growth, low unemployment, and low inflation. In her Huffington Post article, Kathleen Miles suggests that the "Next Time Someone Argues For 'Trickle-Down' Economics, Show Them This." Conservatives like to say that "a rising tide lifts all boats." In other words, if an executive makes $20 million a year, his income will eventually trickle down into the rest of the economy and ultimately benefit poor people. But that theory hasn't exactly proven true. 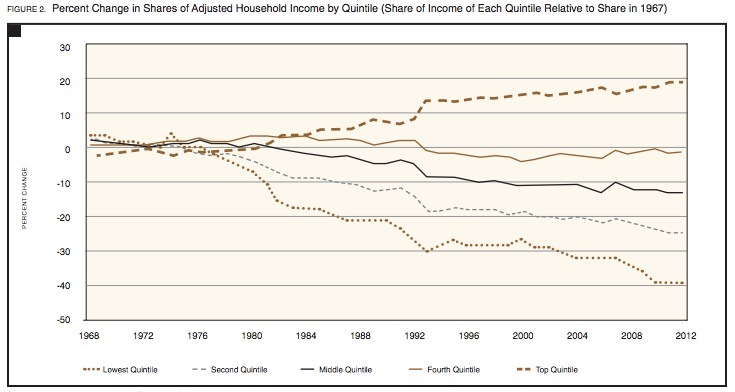 The highest-earning 20 percent of Americans have been making more and more over the past 40 years. Yet no other boats have risen; in fact, they're sinking. Over the same 40 years, the lowest-earning 60 percent of Americans have been making less and less. The chart comes from the Stanford Center on Poverty and Inequality's recently released 2014 report. 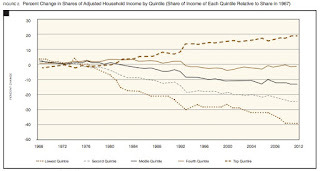 The researchers looked at rising poverty and inequality in the U.S., particularly since the 2007-2008 recession. Other studies have shown a correlation between bigger tax cuts for the 1 percent and income inequality. In the U.S., the top earners have made more money in the last 60 years as the top marginal tax rate has been slashed and as the rising dominance of Wall Street has allowed a few to make enormous profits. An OECD study in 2013 found that the U.S. had the highest income inequality in the developed world. Out of all nations, only Chile, Mexico and Turkey had higher levels of income inequality, according to the study. So what does this all mean in actual dollars? It means that more than half of U.S. wage earners made less than $30,000 in 2012, which is not far above the $27,010 federal poverty line for a family of five. Meanwhile, the top 10 percent of earners took more than half of the country's total income in 2012. In other words, a rising tide has lifted a few big boats and washed the rest aside. Thanks for the informative post. I’m sure that today we live in not bad economic times. Things are quite stable and we can see many new opportunities for a working class, for example. Yes, many Americans still have financial problems and use quick and easy loan products to make ends meet but I think that we all can watch the progress and development. However, with the new President I don’t know what we should expect for. INSPIRED CAPITAL PLC - We are a direct mandates to providers of Bank Guarantee(BG), SBLC, MT109, MT799, MT760, Loans, Sale and Lease of Financial Instruments, discounting and Heavy/light project funding. In addition, we have an excellent professional relationship with many top rated banks, stock brokers, financial institutions and consultants all over the globe. i think you have a long research on economy. That is a beauty full post i like it thanks for sharing. I like your adventure. Joseph Schumpeter's Business Cycles - Business Cycles The link above takes you to a pdf file of Joseph Schumpeter's book. How Green Are Reusable Bags? In the long run we are all dead. wealthiest people in the U.S.
You Can´t Handle the Truth! I welcome comments. Please keep them civil, short and to the point. Obscene, profane, abusive and off topic comments will be deleted. Repeat offenders will be blocked. Thanks for taking part — and abiding by these simple rules. I believe it is extremely important to consider the sources of information. No one should be surprised if news reports on MSNBC have a liberal slant or if Fox News has a conservative bias. Unfortunately, far too many people only seek information that supports existing opinions and they fail to consider all sides of issues. I strongly encourage everyone to seek a broad spectrum of opinions and information sources, carefully consider them all, and then reach one’s own conclusions rather than just parroting what a favorite cable news celebrity might say. The following information is provided to help you understand the biases that may be inherent in this blog. My primary U.S. economic policy concern is the fiscal irresponsibility of government. The Baby Boom generation, which I am part of, has spent the past 30 years accumulating massive public debt that will be passed to our children, grandchildren, and subsequent generations. I am not opposed to the reduction or elimination of any government spending program. Yet, politicians tend to call for reduced spending in general terms and fail to publicly declare specific cuts they would make. The primary cause of the massive U.S. public debt is revenue reductions (in the form of tax cuts) without similar decreases in government spending. I am willing to consider the expansion and addition of government programs as well. I do not mind how much or little the government provides to society as long as it is paid for. I am willing to pay higher taxes for services deemed worthy, whether they be national defense, homeland security, or income assistance to those less fortunate than I. And I am certainly willing to pay less in taxes or to deposit any government check I receive. My generation, the Baby Boomers, has been very good at cutting taxes and increasing the size of government, regardless of which political party is in power. This is a prescription for financial chaos that remains a horrible legacy for future generations. I am a professor of economics at Jacksonville University, where I teach courses in introductory economics, comparative economic development, and globalization. I use this blog to keep in touch with my current and former students. Teachers and students at other schools, as well as others interested in economic issues, are welcome to use this resource.